It is October already, and the year seems to be flying past ever faster! I’ve been out doing rather a lot of foraging recently, and while I wrote about the elderberries already recently, I have yet to address the top of the gorgeously bright coloured hawthorn berries which are adorning so many hedgerows. I tend to leave these til around about now to gather, though some are ready from September onwards – if you are lucky, the birds will leave them alone as late as January so if you don’t get any now, don’t panic too much – have a rummage around in your local hedgerows and you may stumble across a few well laden trees left over. 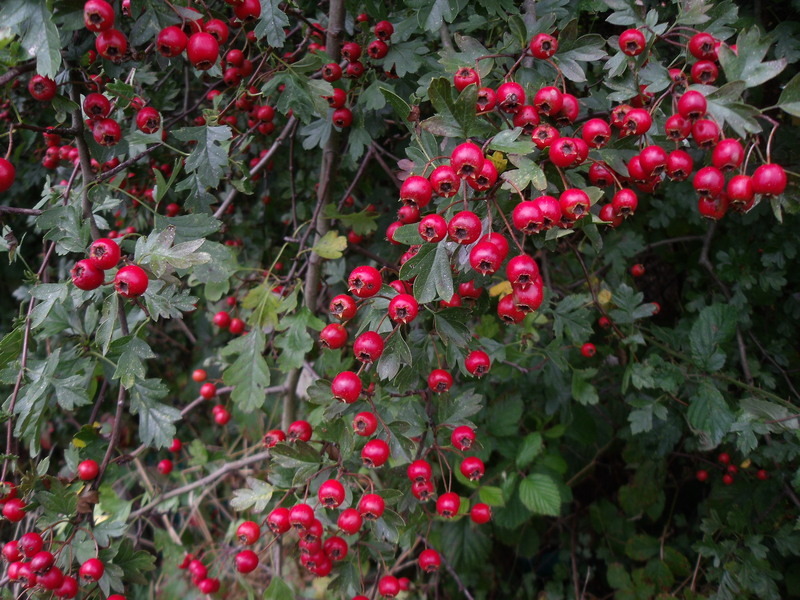 Hawthorn berry picking is a task that requires a certain amount of meditation as it is slow going, especially if you don’t want to risk pulling whole clumps off the tree – I’ve done this a few times recently and it always makes me feel very guilty, even if it was an accident! So pick a lovely day, whatever that means to you, and take your cloth bags out, marking off a couple of hours of time to gather enough berries for the following recipe. Brown sugar, honey or sugar alternative to taste. I tend to use honey these days as I don’t really eat sugar any more. Pick over the hawthorn berries, and remove as many short stalks as you can, then put the whole lot into a saucepan with the red wine vinegar (just cover the berries). Bring to a steady simmer until the berries soften – this usually takes around 30 minutes. Push the whole lot through a colander to remove the stones, and put the pulp back into the pan with the curry powder and the finely chopped or crushed garlic. Simmer the whole lot for another ten minutes, and add honey to taste. You may find you need to add more red wine vinegar at this point if the consistency is not quite right – ideally this needs to be ketchup consistency, so basically pourable. When you are happy with the taste and texture of the finished product, pour it into clean bottles and put the lid on. Allow to cool. This recipe keeps in the fridge for a good amount of time, though you will probably find that its so tasty, it has been eaten within a month! I eat this recipe with cheese, cold meat, savoury food in general, and it works a charm. Another variant of this recipe is to add plenty of chopped fresh rosemary (finely chopped) and other savoury herbs from the garden, then simmer the whole lot up with the garlic in. Don’t add the curry powder if you are doing this recipe though as the flavours don’t work together all that well. 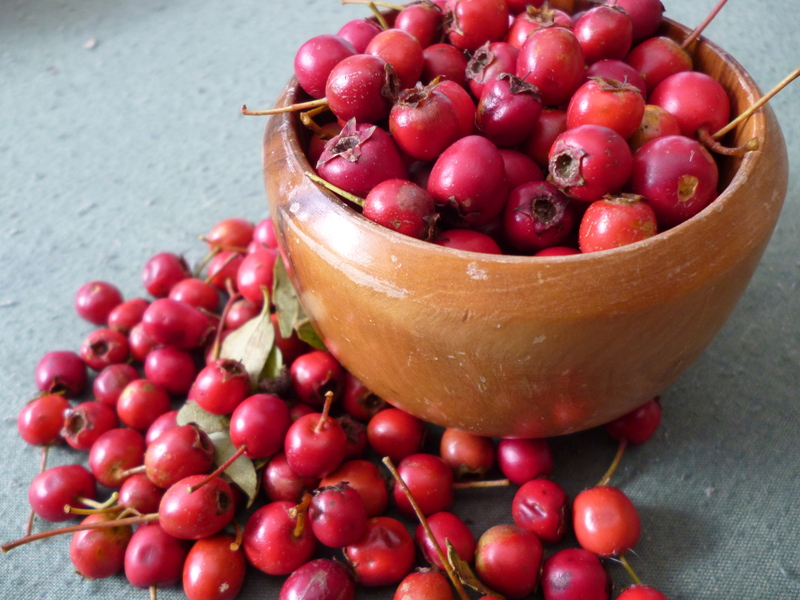 More hawthorn recipes in the next few weeks – happy picking!